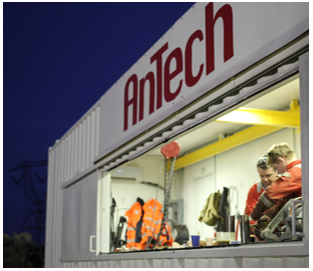 In November 2015, AnTech completed an Underbalanced Coiled Tubing Drilling project for an independent operator in the Appalachian Basin in the North East of the United States. The chosen area was in a well understood area with numerous offset wells with which to compare production and a known geology against which to plan the well. The main objective was to bring the well back to production by side-tracking an existing wellbore. The objective was to access target zones identified adjacent to a recently drilled, vertical well using a lateral side-track. The target thickness was approximately 15ft, so accurate depth control was critical. It was also essential that the entire reservoir section be drilled underbalanced to minimise formation damage. For any Coiled Tubing Drilling (CTD) job to be viable, it is fundamental that the coiled tubing is capable of transferring sufficient weight to the bit in order to maintain an effective rate of penetration. In addition, while maintaining a sufficiently energetic flow regime in the annulus to clean the hole, the downhole pressures must be low enough to prevent lost circulation and formation damage and the internal coiled tubing pressure at surface must be low enough to avoid premature tubing fatigue. In order to ensure that these conditions could be met during the operation and that the work could be completed successfully, considerable pre-well analysis and modelling was carried out. The modelling was completed in-house by AnTech using its proprietary software, designed specifically for CTD operations modelling. Feasibility analysis focused on three main areas: well path planning, tubing forces and hydraulic modelling. A bespoke financial model was analysed in order to decide which of the wells was going to be drilled first. There were several wells available but, after analysing the different options, it was the uncased well that was chosen. This well was chosen because from a value analysis carried out on the candidate wells it was found that this well had the shortest payback period if it be made to produce at a similar rate to neighbouring wells. Two hole size options were considered: Drilling a 6-1/8” hole using AnTech’s 5” Bottom Hole Assembly (BHA) POLARIS from the existing 7” casing without running an extra casing or, running a 4-1/2” casing and drilling a 3-3/4” hole with AnTech’s 3.2” BHA COLT. Models for both scenarios were run and both options would have provided sufficient Weight on Bit (over 4Klbf) throughout the lateral and would have cleaned the hole efficiently. However, it was the latter option that was chosen despite both options being technically feasible. The reason was that the 7” casing was not deep enough to straddle the potentially troublesome shale zones that would have to be drilled through, so there was no way of avoiding the extra cost of the 4-1/2” casing. The drilling fluid selected for the operation was a mix with water and nitrogen, which would allow to maintain the underbalanced conditions at all times. 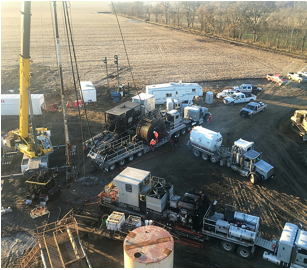 Once the well had been prepared for the sidetrack, the Directional Coiled Tubing Drilling associated service providers arrived on site and began rigging up. The BHA was run on approximately 10,000ft of 2-3/8” coiled tubing with a seven conductor electric line inserted. The coiled tubing and associated equipment were trailer mounted. Using a crane, the injector and lubricators were suspended above the Blow Out Preventer stack. Thanks to the short length of the COLT BHA - 40ft including motor and bit - , it was possible for the entire assembly to be contained within the length of a 48ft lubricator. This enabled the BHA to be deployed safely and efficiently in one run from the lubricator above the BOPs. Additionally, the portability of COLT allowed the BHAs to be made up horizontally, leaving only the Coiled Tubing connection to be made vertically. Time drilling was used to establish a side-track in the cement plug. During this process, the BHA’s instrumentation gave a clear indication of the high levels of vibration to which it was exposed. This information is invaluable to the driller, who can modify the drilling program to minimize the vibration to prolong the life of the BHA and the bit. The near bit survey instrument gave a positive indication that the side-track had been successfully initiated. While drilling the hold section, two substantially productive fractures were intersected. Drilling was temporarily suspended and, with the BHA still in place, nitrogen was introduced into the fluid stream, lowering the Bottom Hole Circulating Pressure to a point where the fractures produced. This gave the operator a simple, immediate, measure of the productivity of the intersected fractures. Subsequently, drilling continued. While drilling the build section, a marker formation was observed on the real time gamma that came in much shallower than expected. The significance of this was that, if deeper formations followed the same trend, the planned trajectory would land much further below the target formation top than intended. It was perceived that the risk of hitting a water zone was very high and so the operator decided to reduce the side-track length and not drill the full horizontal section. The final section of the well was drilled at a controlled Rate of Penetration whilst using samples of cuttings to determine when the reservoir had been entered. This section was also drilled underbalanced with nitrogen to minimize formation damage. Re-drill of a marginal well currently producing low quantities in an economical way. A non-productive well was brought back to production after side-tracking. A previously drilled dry hole was used to access a bypassed oil reserve. Captured technical learnings and best practices.